Sydney at Easter seemed a bit of a gamble. The weather could be fickle and it’s not exactly the summer high season. Nevertheless we booked Wyndham Sydney about 9 months out and looked forward to the date-to-go, all the way from Perth. Upon check-in, after getting an easy bus ride in from the airport that stopped right at the front door, we were extremely pleased with our room. As usual, spotless cleaning had been attended to after the last Owner stay and we had a view. The location turned out to be excellent with very easy walking access to Chinatown, the Skyrail and Central Station. Good Friday was really a very good Friday with someone up above turning on the very best of weather. This made the harbour shine and sparkle and we had no hesitation to get on the Manly ferry for that day trip that everyone talks about. And it didn’t let us down. Absolutely amazing views within Port Jackson, both of the man made and the natural. We chose to hire bicycles at Manly to ride out to North Head. The Manly tourism people really know how to make things easy and before long we were off to see the sights. And could the sights get any better? Well, yes they could. The views from North Head are nothing short of superb and once there, you can look back clear across the harbour to the Opera House and Bridge … with all the sailing boats in the harbour as well. 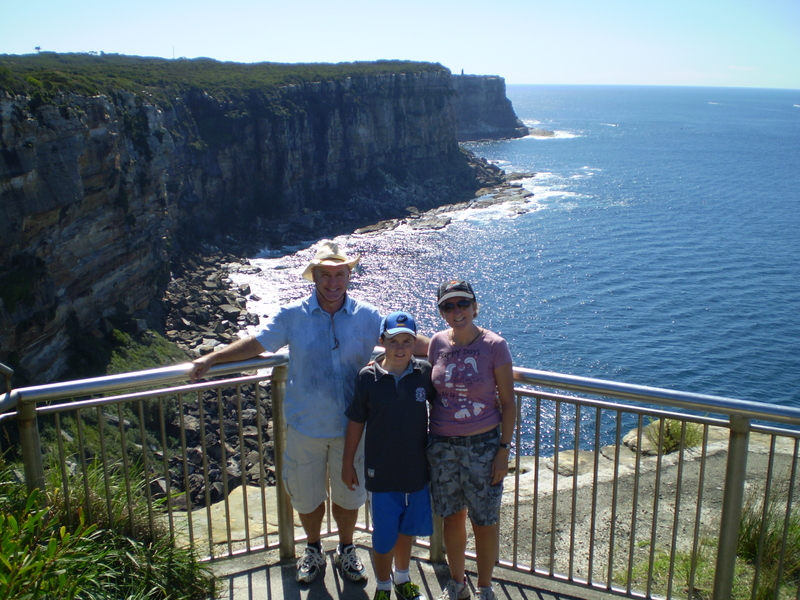 Our photo shows us sweaty and happy at North Head with dramatic clifftop drops nearby. We loved it. Wyndham Sydney made a great base to see the sights from and after 7 nights we were sad to have to go home. But we know that we can easily do it all again because of our Owner Credits up our sleeve. And honestly … 7 days of sightseeing and we didn’t even scratch the surface. I’d like to tell you about my 10 year old son getting to steer the ferry under the bridge and past the Opera House on a nighttime harbour cruise…but that’s another story! We had a great family time. This entry was posted in (NSW) Sydney and tagged australia, Easter, holiday, new south wales, Sydney, vacation ownership, worldmark, Wyndham Resorts. Bookmark the permalink. How time flies, it is still the ester of one year ago, and now this easter is coming, wish you a good holiday this time, hope for your fancy sharing about your easter travel then.